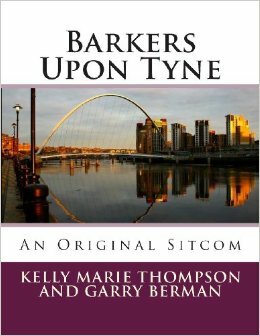 Barkers Upon Tyne is an original, unproduced situation comedy series created and written by Kelly Marie Thompson (from England) and Garry Berman (from America). The six episodes follow the exploits of three siblings in their twenties: Pete, Alex, and Nicola Barker of the northeast English city of Newcastle Upon Tyne. The Barkers are 'temporarily' all sharing Pete's apartment, and have a knack for causing considerable disruption in each others' lives. Accident-prone Nicola's disastrous dating history is legendary among those who know her, as is chronically-unemployed Alex's half-hearted attempts to hold a job for more than a week at a time. Responsible nightclub manager Pete is often the hapless victim when his younger siblings' lifestyles intersect with his own--and usually at the worst possible moments. While writing the pilot episode, the collaborators decided to write a total of six full episodes, partly just to see if they could do it. And they did--in about eight weeks. The pilot episode earned a Top 10 finish in the 2012 Writer's Digest magazine annual scriptwriting competition. Due to the unpredictable fate of scripts intended for production but which may not reach that goal, the authors decided to make Barkers Upon Tyne available in printed form for any reader with a healthy sense of humor to enjoy.